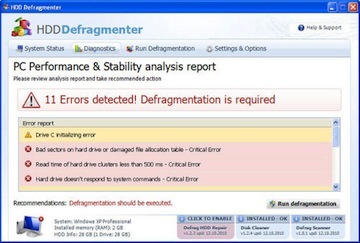 The HDD virus advertises itself as a legitimate program, a hard drive defragmenter, but it’s really malware. If you fall for their ploy while trying to defragment your hard drive, you won’t be the first, since we’re seeing many infected computers in the Ducktoes virus lab. 1. Download and run Malwarebytes. Click here to get Malwarebytes. If you have trouble downloading and installing Malwarebytes, start in Safe Mode, by tapping the F8 key while booting. Then pick “Safe Mode with Networking.” Either way, you’ll need to update and run the program. Restart the computer. 2. Next download and run either AVG or Avira. These are both excellent anti-viruses and both free for home use. 3. Then just to be safe, download and run Super-Anti-Spyware. You should now be HDD Virus Free. The next blog post will be about good, safe legitimate defragmenters, so stay posted. If you’re having trouble removing viruses from your computer and you live in Calgary, come to our shop at 902 Centre St. NE right outside downtown or give us a call. We’re Ducktoes Calgary Computer Repair and Virus Removal. Outside of Calgary, you can use Bleeping Computer to fix your computer for free. If you need computer repair click here or IT business services click here.